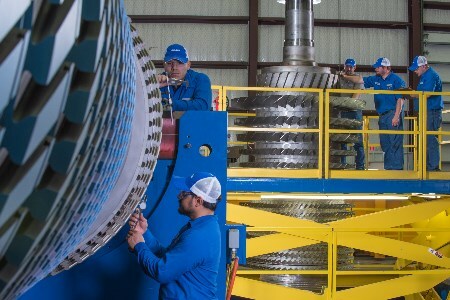 Sulzer’s Houston Service Center in La Porte, Texas, has passed a major milestone in its exemplary safety record, operating for over three years without a lost time injury. This equates to over six million manhours in an industry that has some challenging working environments. Sulzer’s specialist engineers regularly travel to customers’ sites throughout North and South America where there is a constant need to assess new surroundings and potential hazards as part of everyday work. Sulzer encourages all its staff to actively participate in the safety culture of the company and work continuously to improve it. Where field service teams are required on site there is often a need to provide evidence of safe working procedures. The Sulzer team implemented a range of effective techniques to enable good working practice and improve hazard awareness and instill safe thought processes. The ‘two-minute drill’, for example, requires an employee to take time before starting a task to look at the hazards involved and find ways to mitigate them. When a task is interrupted, the two-minute drill is implemented again to take note of changing conditions. It also allows the employee to verify they have everything they need to do the task safely and efficiently. This type of practical safety precaution is discussed, approved and implemented via an employee-led Safety Committee - designed to facilitate participation and engagement. The committee produces a periodic notification or ‘safety alert’ that discusses near-misses involving Sulzer employees or those that were witnessed by Sulzer employees while working on a project. Identifying the near miss and finding the root cause allows for corrective action to be taken and then shared with the community. The notifications are communicated to all Field Service personnel. Training also plays a big part; all Field Supervisors for instance are provided with 30 hours of Occupational Safety and Health Administration (OSHA) training. Personnel in other key roles are also provided with OSHA training, all full-time millwrights, for example, receive 10 hours. Since, by definition, Field Service activities are performed at unique locations all over the world, Sulzer also maintains a presence from its safety team as often as possible. Individual work sites are audited, site conditions verified and employee engagement that meets or exceeds Sulzer standards is confirmed. Ken Flowers, Regional Health and Safety Manager – Americas, said: “We have achieved a lot, especially considering the complex environments in which our staff work. The continued enthusiasm of our staff to extend this record even further is a great tribute to their dedication and desire to get every job done safely.